MORE Australians are turning to home-grown products despite increasing competition from international retailers, according to figures from Roy Morgan Research. In the 12 months to September 2015, 89.2 per cent of Australians aged 14 years old and above said they'd be more likely to buy products made in Australia up from 85.6 per cent in 2013. While Australia remained the nation's manufacturer of choice, a number of other countries increased in popularity during the same period. Growing numbers of consumers say they'd be more likely to buy goods made in Canada (51.5 per cent up from 42.6 per cent in 2013), Sweden (44.1 per cent up from 36.3 per cent), France (40.9 per cent up from 32.5 per cent) and Spain (27.8 per cent up from 21.3 per cent). Traditionally less regarded nations also improved in the eyes of Australian shoppers, including India (15.8 per cent up from 12.8 per cent), South Africa (21.1 per cent up from 16.5 per cent) and Chile (13.5 per cent up from 9.6 per cent). The heavy-hitters of US, UK and New Zealand bounced back from temporary decline to their highest approval ratings in years. While Australia's top trading partner China was one of the few countries that lost support. Roy Morgan Research CEO Michele Levine says despite often being easier and cheaper to purchase goods online from overseas, the majority of online shoppers choose to buy local. "Alongside our renewed enthusiasm for Australian-made goods, we are becoming increasingly open to, and comfortable with, the idea of buying foreign-made products," Levine says. "Online shopping has broadened our retail horizons, enabling us to purchase items made in all corners of the globe. "International retailers with a bricks-and-mortar presence in Australia have also boosted our perception of foreign-made products. Levine says Japan has slipped from fifth to sixth most popular country of origin for products, despite signing a Free Trade Agreement with Australia in 2014. China has dropped from tenth to eleventh place. "This makes Japan the only Asian country of manufacture in the top 10, so it will be interesting to see whether this slump is temporary or indicative of a wider shift in Australians' shopping," she says. 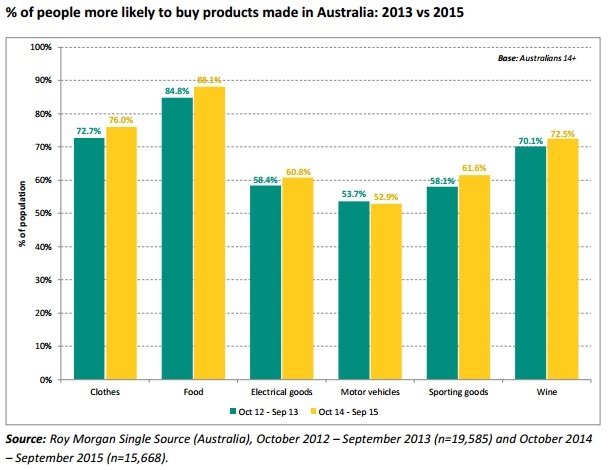 More Australians say they'd be more likely to buy clothes, food, electrical goods, sporting goods and wine if they were labelled 'Made in Australia' compared to 2013. However, demand for Australian-made motor vehicles decreased. "In encouraging news for the country's manufacturing sector, the love affair between Australians and Aussie-made products shows no sign of fading," Levine says.